The School of Education elaborates its conceptual framework by the Effective Teaching Model, with one central domain, six unique domains, and four cross-cutting domains of effective teaching. The Spring Arbor University icon is the artistic representation for the Concept. Placing it at the center of the Effective Teaching Model conceptual framework, through which all the other integrated domains intersect, demonstrates the importance and impact the Concept has on the School of Education and its programs. The Effective Teaching Model exhibits the conceptual framework with six integrated domains, revolving around and rooted in the Concept. 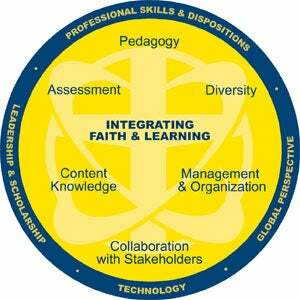 Contained within each circle are six domains for effective teaching. The descriptions for each domain follow. Integration of Faith and Learning enhances the development of professionally empowered educators who exhibit the principles of service to mankind with Christ as the model in personal and professional situations. Pedagogy, or the art and science of teaching, includes a repertoire of instructional strategies with learning as the central focus. Effective teachers have the ability to adapt learning to individual student needs through a variety of teaching methods. Content Knowledge encompasses the theories, principles, and concepts of a particular discipline. This includes deep knowledge of the subject itself as well as an understanding of how that content is integrated and best taught across the curriculum. Assessment involves selecting, developing, and using appropriate strategies and instruments to measure achievement of program goals and instructional objectives. It includes an understanding of the effective use of different forms and timing of classroom assessment as an integral part of learning and teaching. Diversity encourages an understanding of how students differ in their approaches to learning and the need to create instructional opportunities that are adapted to diverse populations. This domain recognizes the influence of culture, language, race, ethnicity, gender, religion, and cognitive and physical abilities on student learning; supports the learning of the exceptional child, and promotes development of an inclusive environment. Management and Organization involves planning to maximize learning; organizing time, materials, equipment, and data to enhance academic performance; minimizing interruptions and behavioral problems; and motivating learners. Collaboration with Stakeholders involves building working relationships and communicating effectively with stakeholders to enhance learning; promoting effectiveness; advocating for change and developing practical strategies and processes through which people can effect change, solve problems and improve practices. Professional Skills and Dispositions are habits of thinking and action that emanate from professional attitudes, values, and beliefs. They are demonstrated through both verbal and non-verbal behaviors as educators interact with students, families, colleagues, and communities. Global Perspective enhances an awareness, understanding and appreciation of the world beyond oneself, one’s community, and one’s culture, as reflected in teachers’ choices and actions. Leadership and Scholarship includes the ability to provide exceptional guidance and direction as classroom teachers and in the larger educational arena through mentoring, service, and advocacy. This domain encourages an understanding of the value and role of scholarship and intellectual engagement to inform and enhance professional performance.